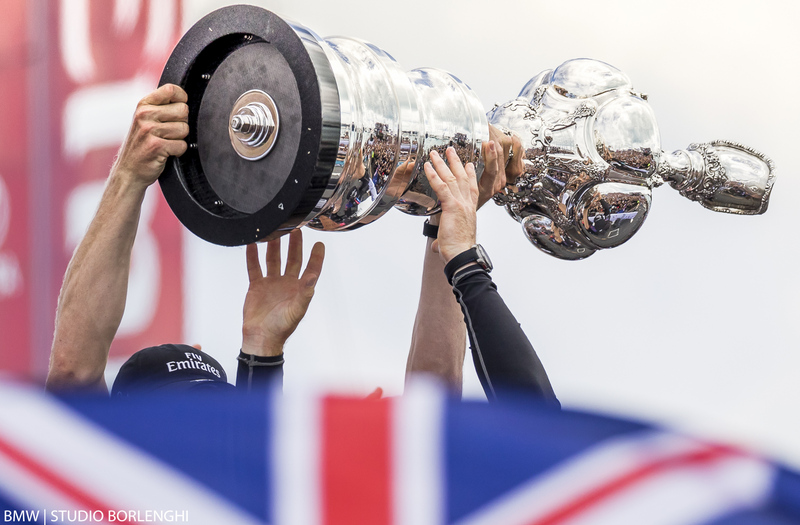 Emirates Team New Zealand lift the oldest trophy in all of sport – The America’s Cup – and celebrate victory after beating Oracle Team USA 7-1 in the final match after five days of racing (17-18 June and 24-26 June) in Bermuda. Four years ago the America’s Cup gave us one of the greatest comebacks in sporting history as Oracle Team USA, with Sir Ben Ainslie on board, roared back from 8-1 down to secure an incredible 9-8 triumph against New Zealand in San Francisco. This time there was to be no fairy-tale comeback for the USA – not even the merest hint of one. Emirates Team New Zealand, powered by their posse of pedalling sailors, claimed the 35th America’s Cup in emphatic fashion in Bermuda on Monday, 26 June. Leading 6-1 overnight and needing just one more race win to secure the Auld Mug for a third time in the nation’s history – after their successes in San Diego in 1995 and again in Auckland five years later – the Kiwis did it at the first time of asking, dominating the USA in the final race as they had done all the way through the final series. There was a lot at stake in this final given New Zealand’s role as conscientious objectors to the new protocols agreed by the five other teams. Now the Kiwis have the Cup, they hold the keys to its future. Suffice to say, there was plenty of frantic negotiating going on in Bermuda on Monday night, and things were developing fast. Within hours of their victory, Team New Zealand had confirmed Italy’s Luna Rossa as the official challenger of record for the next Cup. This scenario was exactly what Larry Ellison, Oracle’s billionaire owner, feared might happen. Not even in his worst nightmares, could he have imagined such a one-sided final. New Zealand even began the final series on minus one as the USA had won the round robin qualifiers. But the Kiwis never looked like losing, winning eight of the next nine races. The one-sided nature of the contest certainly put Land Rover BAR’s and Artemis’ 5-2 challenger playoff defeats in perspective. It took New Zealand all of 10 seconds to reassert control, Peter Burling getting the first gybe in and getting his boat’s nose in front. Thereafter it was, quite literally, plain sailing. Or rather, plain cycling. The five other teams had all said in the lead-up to this America’s Cup that they were not that worried by the Kiwis’ radical boat design, which they had developed in secret back in Auckland and which featured four grinders on static bikes – or ‘cyclors’ as they dubbed them. By the end, however, it was becoming apparent just how much of an advantage the pedalling power conferred on the Kiwi boat; an extra 30 per cent in hydraulic pressure, according to Land Rover BAR grinder Freddie Carr. It was what they did with that extra power which was so impressive. The Kiwis’ aggressive design and radical control system, which allowed Burling to concentrate on driving the boat as Glenn Ashby and Blair Tuke – with whom Burling won Olympic 49er gold last summer – trimmed the foils and wing, paid off in spades. The Kiwis’ ambition and commitment to innovate absolutely deserved the ultimate reward. So Burling becomes the youngest helm in America’s Cup history. At 26 years old he is four years younger than Spithill was when he won the Cup for the first time. It was some performance. Only once in this America’s Cup – when he made the mistake that led to the Kiwis’ spectacular capsize against Land Rover BAR in the playoff semis – did Burling looked truly rattled. The way that New Zealand recovered from that setback was deeply impressive; rolling their sleeves up and getting on with it. There may have been gripes in some quarters about the format of this Cup; the fact that New Zealand could win it with an Olympic cyclist on board; some one who had never sailed a boat until a couple of years ago. But New Zealand can hardly be blamed for that. They suffered heartache four years ago in San Francisco, but there was no doubt Emirates Team New Zealand deserved the win this time. The Cup is heading back to Auckland.